For a couple of years I have supplied Gis, mitts etc to club students at discounted prices. The bag just gets bigger and bigger, so I have added the shop to the blog for ease. If you want a new Gi or mitts please e mail me with your requirements (inc size)and I wll bring them down to the club at Selby, Haxby or York the following week. We deal with Blitz sports, in the sidebar you will find a heading "SSKC Shop" and links to the product information for the items. 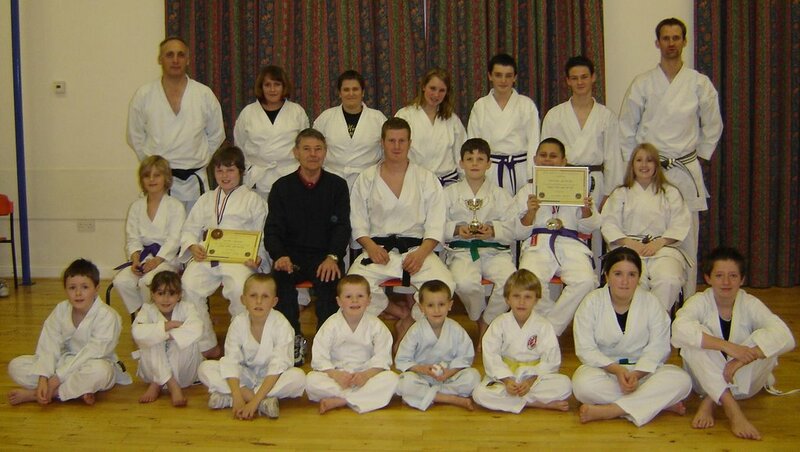 Gullen Shihan has requested that all karateka obtain some mitts for 2007, to improve safety when practising kumite. I have just put a new video clip in the sidebar under "Karate Video Links", this is a brilliant video for anyone interested in Shotokan Karate. It was filmed in about 1982 and is reported to include the following JKA instructors Sensei's Osaka, Imura, Sakata, Kagawa, Ogura, Fukami, Imamura, Yokomichi, Kashiwage, Koike and Mizuno. The video lasts approx ten and a half minutes but it is well worth watching in its entirity. It shows Heian Shodan through to Heian Godan, performed as a single kata and as a group kata, there is also a little commentary, but not too much. Like many Shotokan karateka I never find learning kata easy, but I have developed a few ideas that have helped me with my karate. I always seem to be one of the last to pick up a kata on a course, I am not sure if I am trying to concentrate too much or if it is a skill that will eventually come? I am definitely not day dreaming, although Sensei may think so. Read the article on the 24FC site , excellent. Try and find a video of the kata, e.g the standard JKA "Blue" series. There is video footage of Sensei Alan, Scott and Tor performing all of the Heian and Junro Kata, Teki Shodan, Bassai Dai and Hangetsu. There is a section of advanced kata Nijushiho, Chinte, Gogushiho Sho, Sochin, Tekki Nidan and Sandan. Also the following Non Syllabus Kata Rantai, Kakuten Shodan, Joko Issei, Hachimon, Mekiyo Nidan and Senka. What is really helpful is that you will see the kata from front and back and both slow and fast speeds, great if you are trying to remember it. 3. Try and write down the kata as soon after the session as possible, get someone who can remember it to perform it, film it or get it on your phone. Sensei taught us "Kashu" on the last course at York. We practiced it on the Sunday night at the club and I got a video of Sensei Ash performing it. I have written the moves down in a table format. It is not enough information to learn the kata from, but enough to refresh your memory when you get stuck the following week. I don't know of anyone else who trys to write the kata down, but I find it easy then to learn the kata properly on my own , then practice over and over again. I have managed to retain Di Ichi, Ni and San that Sensei taught a few years ago, because they are on a sheet of paper and every 6 months or so I can refresh my memory. I of course need to learn many syllabus kata, but I also like to learn some non syllabus kata just for my own sake. Sensei Alan taught Joko Issei on a course that I attended 6 to 9 months ago, I need to improve my movement for sparring so I think I may pull my Joko Issei sheet out in the new year and remind myself what it was all about. I am sure it will help with evasions etc. 4. My last tip for trying to retain kata is to perform kata for warm up, if I get to York dojo early I might try and go through all the kata I know just relaxed, it might take 30 minutes and I might need to do some of them a few times to ensure they are still firmly planted in the memory, but it is time well spent. If I have forgotten a move and come to a halt I can check with Sensei when he arrives and get it correct before I forget anymore. Bernard Schilke - 50 years young! Bernard, appoligies for embarrassing you last night and letting everone know you will be 50 on Christmas eve. Hope you will enjoy your present from the club. Your support is greatly appreciated. Last night was the last training session of the year for Selby Shotokan Karate Club, as tradition demands we did a display of Kihon, Kata and Kumite for the parents, take a Christmas photo and have a little festive food. It is nice to see the Christmas photo a little fuller than last years, a couple of members have moved out the area and more members have joined us following the beginners course in October. Callum, Phoebe, Harry, Ciaran, and Josh. 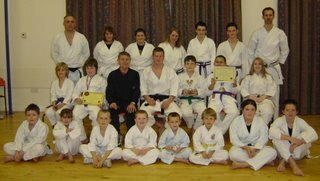 Next to Josh is Joe in the Yellow belt, Joe joined us after starting his Karate with the Swiss Karate Federation, he trained from September 2004 to March 2006 and joined us in the summer after moving to the UK. 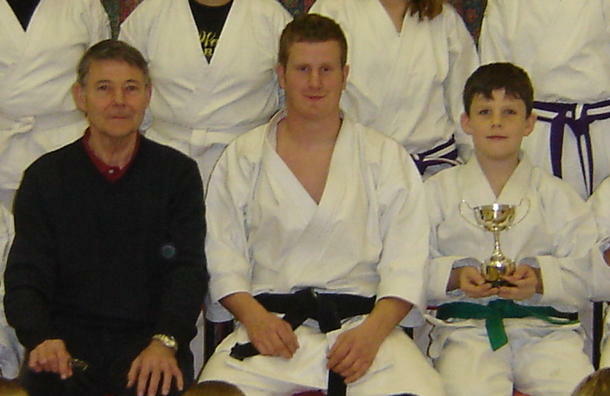 Joe was graded 8th Kyu in Jan 2006 under the SKU Suisse Karate Union. Hopefully Joe will build on what are very good foundations with the SKU now he has joined IJKA Europe. Also a big welcome to Emma and Claire, (Phoebe's and Josh's mums), Emma has a background in TWK and is trying to adapt her style to Shotokan. Claire, I hope you will be the inspiration for other parents to join as well. As I said to the children last night, it is easy to do a sport and enter competitions if you are atheletic, supple and have natural ability. It is a lot harder to join in and stick with something when you still feel perhaps a little awkward. David and I can tell you that awkward feeling does not seem to go away, but it will not stop you enjoying your karate. We started with Kihon, each grade undertaking techniques relevant to their experience. Next was Kata, The beginners performed Heian Shodan up to the first Kia, very impressive, little Josh is still only five until February and everyone had a go, well done! Emma and Joe performed Heian Shodan all the way through. Lucy, Thomas and I think Joe performed Heian Nidan. Thomas stayed on and the purple belts joined them for Heian Sandan and Yondan. Rebecca and Domonic performed Heian Godan and Tekki Shodan. The Brown Belts came on and performed Bassai Dai. Lastly Kumite, the beginners demonstrated knee boxing as a group and we also had individual bouts, there was some very keen tatics going on. The Green and Purple belts also demonstrated some free style. The boys have been training with us for three years now and have only just been introduced to freestyle. This is so they can develop good control of their techniques so they don't hurt themselves or others. Rebecca and Domonic also demonstrated free style at a slightly more advanced level. I also ran through all the club had achieved in the last twelve months, I forget sometimes how far we have come since moving the dojo to Barlby, just outside Selby. I said in a previous post about my Shodan grading that although Sensei Ashley is my instructor, Sensei Trevor is my inspiration. Yesterday I presented to Trevor the Sensei Trevor Jinks Cup, in recognition of his Karate jouney and all he has done for our club. The Cup will be presented annually to a student who has not found "the way" particularly easy but has not given up and continued. The cup was presented to Thomas Robinson ths year, Thomas came up to me afterwards because as usual he wasn't listening when I was explaining what it was all about. Thomas joined the club three years ago with Sam, Daniel and Adam. We do not all learn at the same pace and Thomas does not always find it easy to take on or even retain new information and finds his peers advancing faster than himself. However Thomas is one of our best attenders, when Sam missed his grading he went with him to Shihan Gullens club so he could do extra sessions and grade. He is willing to take part and have a go, even though he knows he is not likely to shine. Many others would have given up their karate but Thomas carries on. Thomas is one of the most relaxed boys you will ever meet and that is why I think in the future Thomas's karate is going to be excellent, probably better than his peers. Every so oftern I will see a flash of perfect technique, there is a black belt inside of you waiting to get out. You may not get there as fast as some, but look to Sensei Trevor for your inspiration, a journey of twelve years to Shodan, what is the rush when you are travelling with friends, just enjoy the journey. Shotokan Karate Magazine have published a five page article on our late chief instructor Asai Shihan. If you don't normally subscribe to SKM, go to their website www.shotokanmag.com and get one ordered. There are extracts from an interview in 1991. ( I believe this might have been Gullen Shihans wife Jean that did this interview, apologies if I am mistaken). There are also extracts from an interview in 1994. Towards the end of the publication is Shihans quote" Try to follow the Dojo Kun in your daily life, in and out of the dojo and you will be a true follower of Karate-Do"
This is a brilliant read and a motivation to all karateka. I have messed around with the template a bit to try and reveal the blogger Nav Bar. You can now search the blog by typing into the white box at the top of the page and clicking on "search this blog"
E.G. If you type in your name it will come up with all the posts that have your name in it. I hope this is of use to our regular readers. It will appear slightly different depending on what programme you view the blog in, if anyone has a problem please e mail me and I will try and fix it. As usual we are have a Cristmas gathering on the Thursday between Christmas and the new year. We will meet in York on Thursday 28th December at 7.30pm, some members will stay all evening some will pop in for half an hour or so. We would like to encourage all adult members old, new or retired from training to join us, the more the merrier. Yesterday I graded for Shodan, my examiner was Kato Shihan and after seven years as Sensei Ashley's student I have now reached the beginning. For our younger students, the ideogram "sho" means first or beginning and the same ideogram is used to express the first sunrise of the year, it is also found in the word for beginner. When you realise the depths of knowledge and skill that can be acquired through karate, you realise that the few years required to attain your first black belt are really just the beginning. Many things in life have limits but their is no limit on the number of black belts that can be given. As long as you practice diligently, sooner or later you will receive a black belt. Students with talent and natural ability may find there way to the beginning a lot quicker than mine, some karateka may take a little longer. If you travel the way too quickly you may miss something, my teacher is Sensei Ashley but my inspiration is Sensei Trevor. Sensei Trevor started the way at fifty and reached Shodan twelve years later and now at Seventy years old is still enjoying the journey. My thanks also to Gullen Shihan, Sensei Mick, Ian and Nick that have also guided me in my journey. We wish all our members and friends seasonal greetings. Sunday 17th December will be the last session of the year. As normal we will be doing a bit of a display for family and friends, so they can see how your karate has developed throughout the year, this will be from 5.30 to 6.30pm we will then have a bit of festive food before we disperse at 7pm. Adult members are invited for a social drink after training. Don't forget, we will be taking the annual club photo, so please ensure that you are there and don't miss out. We return in the new year on Sunday 7th January. Can all members ensure that their 2007 membership forms are completed and returned by the 17th December.